I live in Karachi, Pakistan. I have a coconut tree, which is about ten years old. It has very sweet fruit, but for the last year it has been infested by some bug, which is microscopic and has a white, powdery look. The plant flowers a lot and initially there is a lot of fruit, which grows to about an inch and a half in size but then it shrivels, blackens and dies. Only one or two of the fruits mature, and I get only about two dozen good nuts per year instead of about 150 per year. I think that it is some kind of bug which burrows into the baby fruit and feeds on it or it feeds on the phloem. I am not sure. I have tried Malathion, etc. ·	Proper fertilization with a palm special fertilizer eliminates any nutritional deficiency, reports the University of Florida IFAS Extension. Immature fruit drop is often caused by a boron deficiency. 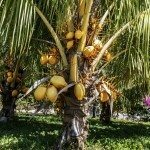 ·	A tiny organism called phytoplasma causes the coconut tree's most detrimental disease --- lethal yellowing. Early disease symptoms are blackening flower stalks and premature coconut dropping. Once infected, the tree's leaves turn yellow starting at the bottom and work inward toward the crown. Palm trees infected with lethal yellowing typically die within six months of exhibiting symptoms. ·	Bud rot is a fungal disease that discolors leaves. Young nuts do not develop, but prematurely fall. Foliar spray treatments prevent the disease, as do treatments with products containing phosphates or phosphorus acid.